My mom used to make ‘peanut butter balls’ for us growing up. This genius invention of hers required 2 ingredients (crunchy peanut butter and confectioners sugar) and about 1 minute of her time while leaving her four kids happy, satisfied and wanting more! Now I’ve come up with a modern twist on this childhood favorite by using two power house foods, almond butter and coco powder, while adding friendly sweeteners like agave nectar and dried fruit. This snack is high in protein and healthy fat and is SIMPLE too. So use these delicious Almond Balls to keep you satisfied and on track with your fitness goals. This is a great snack for kids too! Even my 1yr old son snacks on these. 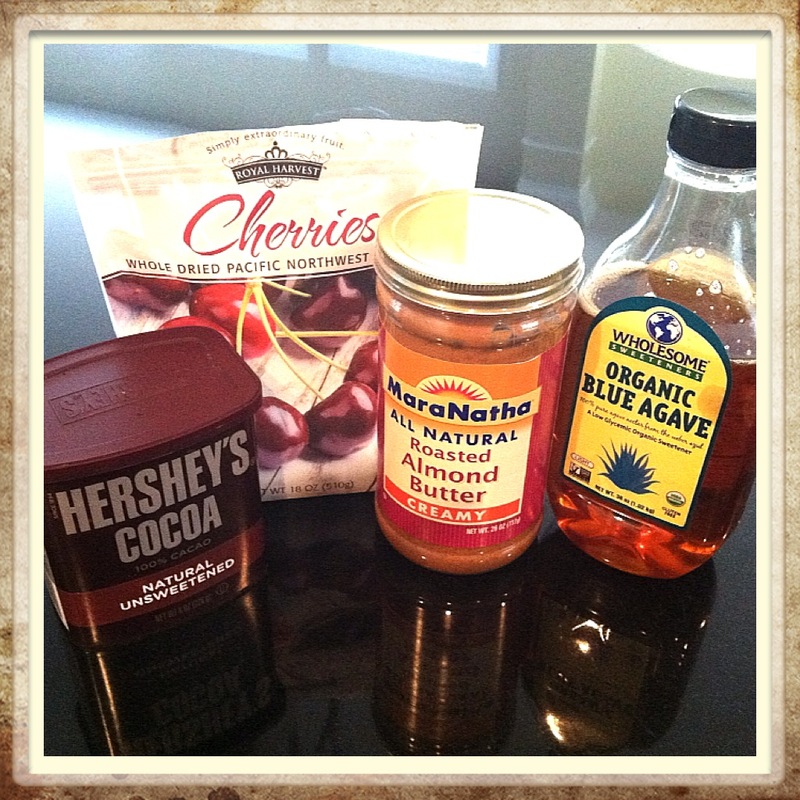 Here’s what you’ll need; Almond Butter, Coco Powder, Agave Nectar and Dried Fruit. I’m using dried cherries which I cut in small pieces. Mix all ingredients together. Now form 1″ balls with the mixture. Store almond balls in the refrigerator so that they’ll keep their shape. Keep it easy and roll the mixture into 1″ balls (see almond ball on far left). 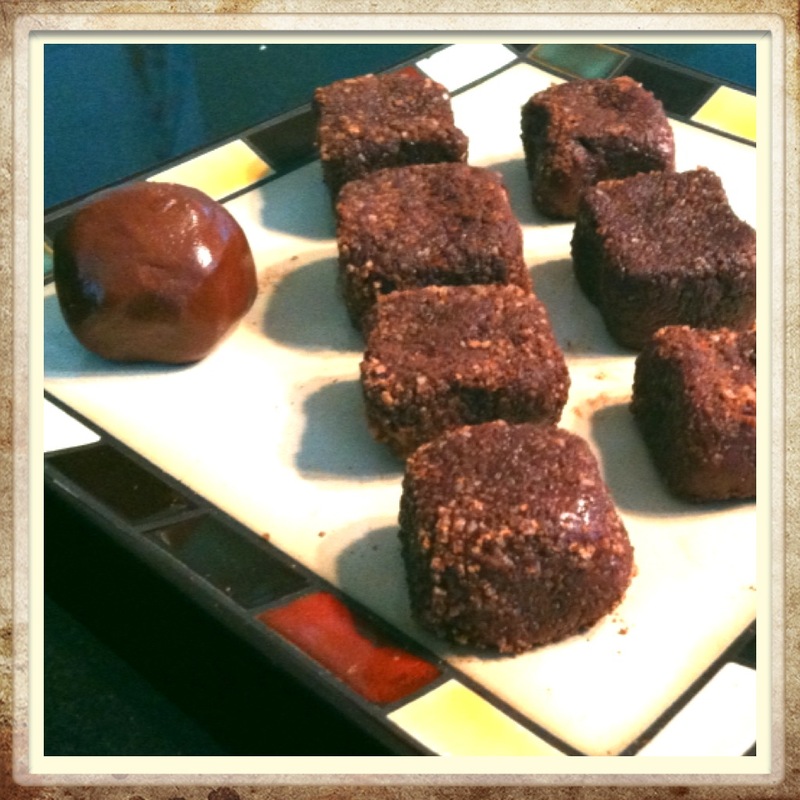 Or for entertaining, mold into squares and dip each side of the square in a mixture of 1Tbsp Coco Powder and 1Tbsp Turbinado Sugar. The crunchy outer layer gives this smart snack an indulgent taste. Soooo delicious!